Express yourself artistically with this bold and beautiful design! Sure to make a statement no matter where it is seen. Get your graffiti fix without fearing the fuzz! 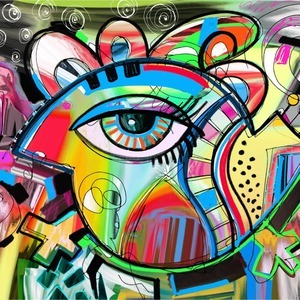 This design features a large abstracted eye in the center, surrounded by extremely vibrant, surrealistic shapes. Works very well on round products, but may surprise you what details will get framed on other products. Mix and match, experiment make it bold, make it beautiful, but most of all make it your own.